Characterized by academic excellence since its founding in 1948, Brandeis is one of the youngest private research universities, as well as the only nonsectarian Jewish-sponsored college or university in the country.Named for the late Justice Louis Dembitz Brandeis of the U.S. Supreme Court, Brandeis University combines the faculty and resources of a world-class research institution with the intimacy and personal attention of a small liberal arts college.Brandeis is ranked in the top tier of the nation's universities. 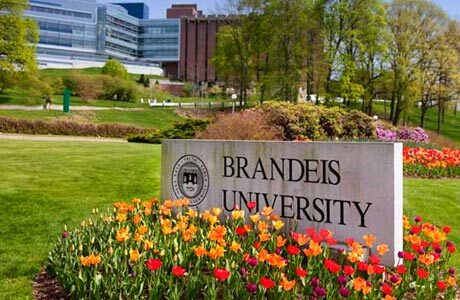 Brandeis offers a number of scholarship and fellowship opportunities to students who have exhibited outstanding achievement in and out of the classroom. These scholarships are awarded to entering first-semester first year students. Please note that once awarded, the scholarship amount remains the same for all years of eligibility. All students will be thoroughly considered during the application process, and with a few exceptions noted below, will not be required to submit any additional materials to support their candidacy for merit aid. For more information on our need-based financial assistance, please visit the Student Financial Services website. The Wien International Scholarship Program has funded hundreds of students from all over the world since its inception in 1958. This need-based scholarship meets the full demonstrated financial need of each recipient and includes funds for one round-trip air ticket each year between the United States and the student’s home country. Wien Scholarships are awarded to exceptionally accomplished international applicants who demonstrate strong academic achievement as well as significant extracurricular or community involvement.